Jamie is an economist with more than 17 years’ experience in capital facility financing, fiscal impact analysis, government reorganization, and real estate economics. Directing complex consulting assignments on behalf of both public- and private-sector clients, Jamie’s work has resulted in successful new and redevelopment projects, including municipal incorporations and former military base reuse projects. Adhering to one of EPS’s core values, Jamie prepares objective analyses to inform clients’ decision making—striving for the most financially effective solution that minimizes uncertainty and shares risks between the public and private sectors. Jamie is one of EPS’s leading experts in implementing infrastructure financing mechanisms, particularly Mello-Roos Community Facilities Districts, development impact fee programs, and related cost-sharing agreement mechanisms. Jamie holds a Masters of Business Administration degree from California State University Sacramento and a Bachelor’s degree in Economics from the University of California at Davis. 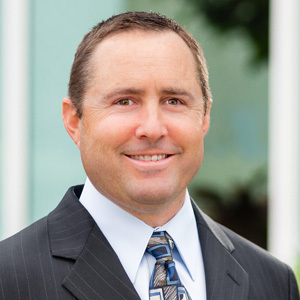 He serves as the Treasurer for the Urban Land Institute—Sacramento District Council and participates in the District Council’s Executive Committee. In addition, Jamie serves as a board member for First U.S. Community Credit Union, a Sacramento-based credit union serving members who live, work, or worship in 12 counties surrounding Sacramento. Finally, Jamie is a member of the American Cancer Society’s Sacramento Partnership Council, which raises approximately $175,000 annually for the society.